I recently started receiving Ozan Varol’s weekly blog posts. He is a self-proclaimed contrarian thinker. A few weeks ago, he sent this post on seven questions to stop asking children. The questions are terrific! I wish I had this 26 years ago to have made family dinner time with our four kids even more productive and interesting. 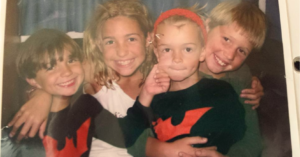 The Hughes kids — Tate, Kayla, Dexter, and Hayden — when they were little. My favorite out of the seven questions below is to stop asking, “What did you accomplish this week?” and replace it with, “What did you fail at this week?” You might think this type of question is the opposite of what I just told you about the “best thing,” so why would this be my favorite? I always wanted my kids to know that it was okay to fail. Our best lessons are learned through failing, and if you are not failing, you are not growing, expanding, getting smarter, etc. Without experiencing failure, people become too risk averse and get stuck living in their comfort zone. One last thought before you get to enjoy Ozan’s post. When I entered high school, my Dad told me I should take all honor classes. I didn’t think I was smart enough, but he told me, “You would be better off to get a C in honor classes than an A in the regular classes.” So I took all honor classes. I never liked school, but I was glad I listened to him. I had to work hard, and I didn’t get all As, but I learned I could do it. Only seven out of over four hundred in our graduating class graduated with honors. I was one of them. I wouldn’t have accomplished that without knowing that, rather than try to be perfect, it was okay to stretch myself and just do the best that I could. A kindergarten teacher was walking around the room to check each child’s work as they drew pictures. “What are you drawing?” he asked one student. This is the typical juxtaposition: The curious and inquisitive child, and the conformist teacher. Our school systems were designed to churn out compliant industrial workers, not to inspire individuals to dream big and challenge the way things are. School taught us obedience and fitting in, so we could properly operate the assembly line in a dingy factory for six days a week. The Industrial Age is long gone. This is the Information Age, but our school system is lagging far behind. The workers we’re still producing to thrive in the Industrial Age wither in the Information Age. During a recent speaking engagement, I got a question from a parent on how to undo some of this damage caused by the education system. Specifically, he asked how he could cultivate curiosity and critical thinking in his children. I’m not a parent so, in one sense, I’m underqualified to say anything on this topic. But I’m a professor and, over the past seven years, I’ve learned a few things for encouraging students to think differently. What follows is a list of seven questions parents typically ask their children. I’ll explain why parents should stop asking these questions and what they should ask instead. The cliche question “What did you learn in school today?” reinforces the traditional conception of education: Put your mouth on the spigot of knowledge. Drink deeply and regurgitate it on demand. Here’s the thing: A willingness to question knowledge is far more important than the ability to receive and retain it. Important dates in the Civil War and the capitals of the fifty states will all be forgotten soon enough. Once ingrained, however, the ability to challenge the status quo and to question confident claims—whatever their source—will remain. We live in a society that stigmatizes failure. Growing up, failure got us grounded or put us into the principal’s office. As adults, we fear failure to a pathological degree. Behind every canvas unpainted, every goal unattempted, every business unlaunched, every book unwritten, and every song unsung is the looming fear of failure. What have you failed at this week? In asking his children what they failed at each week, Sara’s father gave them the breathing room to tackle interesting problems, and yes, to fail. To him, not trying was far more disappointing than failure itself. This isn’t an endorsement of failure for the sake of failure. Failure, by itself, isn’t enough. You must reflect on it, learn from it, and improve on your next attempt. Hence the review question: What have you failed at this week? When a child comes to us with a problem, our initial instinct is to step in to deliver a quick and efficient fix. Resist that instinct. Don’t show your hand. Let them find a solution on their own. The process involved in finding the answer is far more important than the answer itself. When you spoon-feed the solution to your children, you’re acting like a personal trainer who “helps” a client by lifting their weights for them. But when you let your children formulate a solution, you’re letting them exercise their critical-thinking muscles. And just like muscles, the brain must be exercised through reps and sets to grow and mature. After your children solve the problem, ask them to solve it in a different way. Let them see that there’s often more than one way of framing the problem and more than one solution to it. When I was five years old, my parents said it was time for me to go to kindergarten. Instead of doing what most parents do and simply make the choice of the appropriate kindergarten for their children, they told me that I would get to pick. What they didn’t tell me was that they had already vetted the kindergartens in our city and filtered them down to four suitable ones that they presented to me as my choices. This was a formative moment for me, one that’s stayed with me to this day. It told me for the first time in my life that I’m in control of my destiny. It told me that I could think for myself, rather than depend on anyone else to do my thinking for me. What’s more, having made the decision myself, I felt ownership over it. If the experience was anything less than stellar, I had only myself to blame. I’ve heard from several friends that tacos are their children’s favorite food. Who doesn’t love tacos? Aside from their deliciousness, many children probably love tacos in part because they get to make them. Unlike a plate of carrots handed to them—peppered with guilt trips about starving children in Africa—tacos allow children to pick their own ingredients. Having built the taco themselves, the children take pride in it and enjoy it more. Children are masters at asking questions. They’re moved, not by a desire to impress, but by genuine curiosity. They stare at the world, wrapped in awe, and take nothing for granted. They approach life, not with the assumption that they know (or should know) the answers, but with the desire to experiment and absorb. Why do we stand still if the world is spinning? Why does the ground feel cold if the Earth’s core is so hot? Do butterflies poop? (I don’t know. Do they?). These questions annoy many adults who believe that everything important has been settled already (That’s just the way it is). Instead of stifling your children’s curiosity, nurture it. Encourage them to ask questions and remain curious about the world. It’s this process of open-minded inquiry that has resulted in every major human breakthrough. The longer your children can resist the strong temptation to replace curiosity with complacency, the better off they will be. Don’t tell your children that their ideas are crazy or infeasible. Imagine if a young Einstein had been silenced when he posed this seemingly crazy hypothetical: What would happen if I chased after a beam of light? This question could have been reflexively dismissed as absurd by a busy teacher or an annoyed parent. Its resolution ultimately culminated in the special theory of relativity. The first question treats school like a superficial networking event (How many business cards did you collect?). The second one encourages forming meaningful connections and developing a spirit of generosity. It sends a far better message: Always be on the lookout for opportunities to help others. It may have occurred to some of you that this post is a Trojan Horse. These questions are as much for you as they are for children.